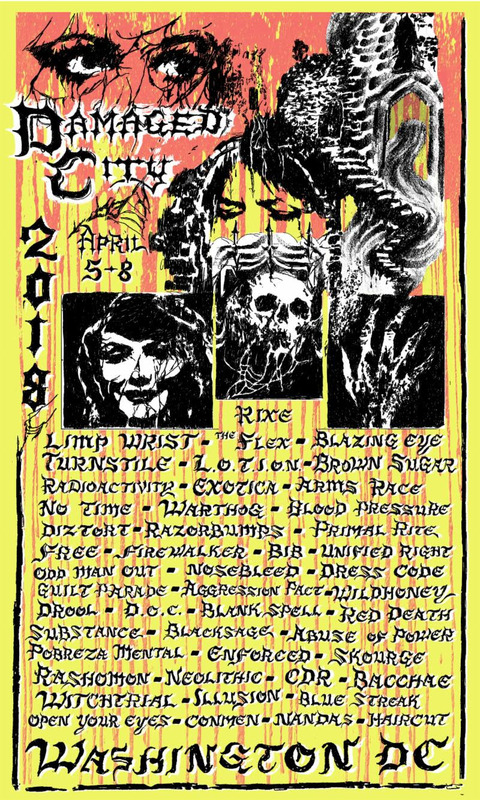 Limp Wrist, Turnstile, Radioactivity, The Flex, Warthog, Rixe, Blazing Eye, Brown Sugar, Arms Race, L.O.T.I.O.N., Red Death, Exotica + More! The Damaged City Art Show artist lineup has been announced! The show has become a staple of the DCF weekend and closes out the fest Sunday. Curated by D.C. native Sarah O’Donoghue, punk artists and photographers from all over the world like Alex Heir, Swampy, Angela Owens exhibit their work alongside performances from bands like Nandas, Haircut and more. Click here for more details or scroll below for the full artist roster. Metro = Rhode Island Ave.
Damaged City was dreamed up by bandmates and co-founders Chris Moore and Nick Candela while on a long overnight drive on a European tour with their band, Coke Bust. They were talking about the pros and cons of festivals they’d played in the past. D.C. had always had a good energy in the punk community, but bands were constantly skipping over the city. They really wanted to show everyone all the amazing bands from their hometown and also bring bands that didn’t typically play there. Moore has been organizing shows, events and playing in bands in D.C. for almost 15 years. Moore notes “I don’t want to say that this city needed something like this, but it just felt right.” The first year was a total success and the overwhelming support afterward made them want to continue doing it. One Month Till LEVITATION Austin! Final Additions + Set Times Announced. Documentary Premiere, Day Shows + After Party Benefit.